If you like homegrown handpicked music, you will love the Austin Pickin Ranch. We love bluegrass music and the instruments that play it. We see bluegrass as a gateway music to all other music. From bluegrass, it’s a short leap to playing any style of music. I’m Ritchie Mintz. I picked up guitar at age 8 and banjo at 12. By 15, I was teaching both. My books are not just books: — They are a well-thought and time-proven system that I have used to teach all the bluegrass instruments to hundreds of people. The biggest secret to being a musician:– First you learn music, then you learn your instrument, then you forget them both and you just play. 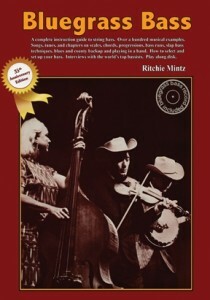 Bluegrass Bass — Our 37th year and still the blockbuster instruction guide that has taught generations of bass players. Bluegrass Bass ($39.95 + shipping & handling) dovetails with Universal Music Theory For Any Instrument. Includes theory, technique, interviews with the world’s top bassists, and an instructional CD. You can play along! Half of playing bass is having one. The other half is Bluegrass Bass. Enjoy this free sampler of Bluegrass Bass before you order. 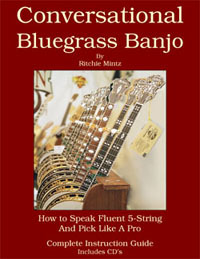 Conversational Bluegrass Banjo – How To Speak Fluent 5-String And Pick Like A Pro ($59.95 + shipping & handling). This banjo instruction method is how I learned and how I teach. It’s a revolutionary method for learning 5-string banjo. There is no TAB! I teach by the right hand rolls, which are the vocabulary of playing bluegrass banjo. Learn your rolls from this book and you will speak Conversational Bluegrass Banjo. Then, you’re pickin like a pro! If you struggle with TAB or if you want to find out what TAB is trying to tell you, this book is for you. Enjoy this free sampler (which includes your first roll!) before you order Conversational Bluegrass Banjo – How to Speak Fluent 5-String And Pick Like A Pro.